People's trust in government has fallen to a historic low, and the gap between their trust in governments vs. businesses has reached its widest gap ever in the 14 years since a top communications and public perception agency began tracking it. 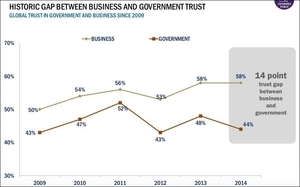 The findings, which come from the 2014 Edition of the Edelman Trust Barometer, used the word "decimation" to describe the erosion of trust in government over the past year, and noted that while trust in businesses has remained stable, it hasn't grown either. "Trust in government fell globally four points to an historic low (44%), making it the least trusted institution for the third consecutive year," the report reads, noting that the erosion of confidence has been even more pronounced in "informed publics." In the U.S., for example, government trust fell 16 points to 37% this year, third only to the erosion of government confidence in France (-17points to 32%) and Hong Kong (-18 points to 45%). “This is a profound evolution in the landscape of trust from 2009, where business had to partner with government to regain trust, to today, where business must lead the debate for change,” Edelman President-CEO Richard Edelman states, noting that businesses are now expected to play a "much bigger role around the debate and design of regulation." Among the report's key findings is the fact that nearly four out of five (79%) consumers now believe governments should not be working along when setting public policy, and an even higher percentage (84%) believe that businesses can "pursue self interest while doing good work for society." That last sentiment has become a key element of the strategic positioning of some of the most ascendant global and regional brands, according to research from a variety of sources, especially Havas' ongoing tracking studies on the nature of "Meaningful Brands."